Pulled pork is nothing new. In fact it seems to be making an appearance at just about every cafe, restaurant and pup-up we know this year. But how can you be sure that what you’re getting will be a prime porker instead of a rotten runt? The place to go is The Greedy Pig which has had customers squealing with delight for the last couple of years, particularly on social media, about their delicious deli dishes. Walking in to The Greedy Pig is like walking through the door at your Mum’s. It’s comfortable, it smells of home cooking and you’re always welcome to pull up a seat and grab a paper to read. Located on North Street just a couple of doors down from the newly refurbished Crispin Lofts, this comfy cafe has set tongues wagging (and mouths drooling) with its extensive selection of tasty treats (they are masters at the Veggie Breakfast too) and has fast become one of our favourite weekend spots. The owners are Jo and Stu, partners in real life as well as in the kitchen, who really champion the independent scene in Leeds and aren’t too shy to voice that on social media. What’s more, they’ve recently unveiled a scheme in support of St George’s Crypt where customers can buy an extra coffee which they’ll make sure goes to a person in need, in the hopes it may help reintegrate them into society and be the first step to a happier and safer life. How fab is that? We are Stu and Jo, husband and wife, owners of The Greedy Pig on North Street Leeds. Stu has been a chef for a good few years now, working in various establishments in Leeds. He started off in what was Leodis, Haley’s Hotel in Headingly and then Harvey Nichols. Jo worked with young adults with learning disabilities and baked…an awful lot. We took over The Pig two years ago simply because with our shifts we never ever saw each other. We’ve gone from that to being together all the time! But despite the stresses and long hours running our own business, we love it and don’t regret a moment. What’s The Greedy Pig philosophy? The Pig had a rather poor reputation when we took over and we’ve worked really hard to turn it around. We’ve done that by cooking the food we love and enjoy, using good ingredients and aiming for consistency in everything we put out. We figured if we look at our food and think “yep, I’d happily pay for that” then we can’t go far wrong. What makes The Greedy Pig unique? You can buy a burger in many places in Leeds but none of them will have Stu’s relish on them! The Hog Roast has his combination of herbs and spices on them. You can only get Jo’s brownies at The Pig. It’s our experience and knowledge. And despite the fact we serve unpretentious food, no faff or fuss, there is still that attention to detail – your breakfast will look exactly like the breakfast of the person sat next to you. Plus (and this is a big plus) everyone is served with a smile. Over the years we’ve have had many jobs which dealing with the general public and we have always tried to provide a good service. I hope that this is evident, even though sometimes we can get extremely busy. Good quality food, cooked to order. We’re not “fast food” so you can expect to wait a few minutes longer than in your average sandwich shop but the results are definitely worth it. Customers can hopefully expect to see us venturing out from The Pig in the future, taking our food on the road. We’re lining up a few Sundays at Handpicked Hall starting this weekend in fact! Stu’s Beef and Porcini Burger is the best burger we’ve tasted . He’s a fan of the Pulled Pork sandwich and both are 3.25. Our son loves Stu’s twice cooked chips which are 1.00 with any sandwich. Stu makes the best soup in Leeds – not particularly flash but extremely tasty. We’re not from Leeds. Jo’s from Dumfries and Stu’s from Stockton. We met in Bradford but moved to Leeds when Stu got his first chef position. We’ve been here nearly 15 years and love it. It’s not too big, a fairly compact centre you can cross relatively quickly on foot. And recent years have seen a good indie food scene develop. Lots of like minded people who see each other as a community and support rather than a threat and all aiming to give Leeds character so people return again and again. We’re really proud to be considered part of the indie food map in Leeds (and slightly surprised by our success). Since taking over The Pig we don’t get out all that much but not surprisingly we tend to go to other indie places. Laynes and Bottega for coffee. Dave at Sunshine Bakery does an amazing burger on a Sunday. We’ve been known to have the odd cheeky beer at Friends of Ham. Otherwise we frequent the parks in Leeds with our son with football or tennis racket in hand – another reason we love Leeds. 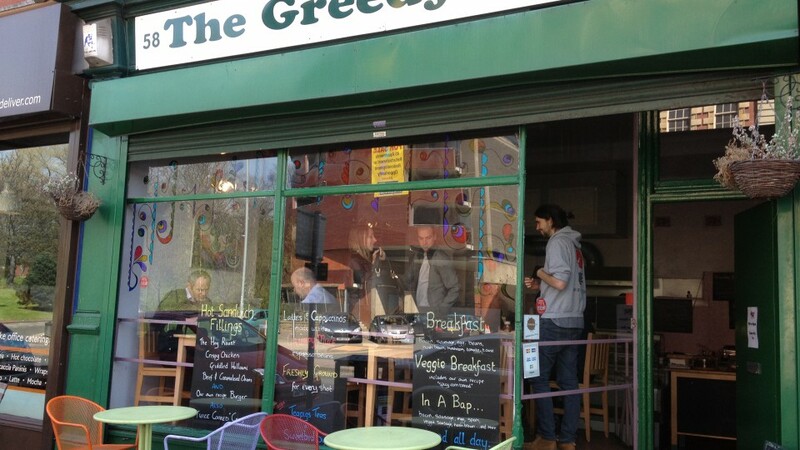 The Greedy Pig are open Monday to Saturday until 3pm. They’ll be popping up in many different places around the city in the coming months, starting with Handpicked Hall in the Grand Arcade this Sunday 21 July.